Conservatism was bitterly split into the returning old aristocracy and the new elites arising after 1796. The old aristocracy was eager to regain its land, but felt no loyalty to the new regime. The new elite, the "noblesse d'empire," ridiculed the older group as an outdated remnant of a discred regime that had led the nation to disaster. Both groups shared a fear of social disorder, but the level of distrust as well as the cultural differences were too great, and the monarchy too inconsistent in its policies, for political cooperation to be possible. Louis, in accordance with the Declaration of Saint-Ouen, granted a written constitution, the Charter of 1814, which guaranteed a bicameral legislature with a herary/appointive Chamber of Peers and an elected Chamber of Deputies – their role was consultative (except on taxation), as only the King had the power to propose or sanction laws, and appoint or recall ministers. The franchise was limited to men with considerable property holdings, and just 1% of people could vote. Many of the legal, administrative, and economic reforms of the revolutionary period were left intact; the Napoleonic Code, which guaranteed legal equality and civil liberties, the peasants' biens nationaux, and the new system of dividing the country into départments were not undone by the new king. Relations between church and state remained regulated by the Concordat of 1801. However, in spite of the fact that the Charter was a condition of the Restoration, the preamble declared it to be a "concession and grant", given "by the free exercise of our royal authority". The ultras broadened their support, and put a stop to growing military dissent in 1823, when intervention in Spain, in favour of Spanish Bourbon King Ferdinand VII, and against the Liberal Spanish Government, fomented popular patriotic fervour. Despite British backing for the military action, the intervention was widely seen as an attempt to win back influence in Spain, which had been lost to the British under Napoleon. The French expionary army, called the Hundred Thousand Sons of Saint Louis, was led by the duc d'Angoulême, the comte d'Artois's son. The French troops marched to Madrid and then to Cadiz, ousting the Liberals with little fighting (April to September 1823), and would remain in Spain for five years. Support for the ultras amongst the voting rich was further strengthened by doling out favours in a similar fashion to the 1816 chamber, and fears over the charbonnerie, the French equivalent of the carbonari. In the 1824 election, another large majority was secured. At the opening of the session in March 1830, the King delivered a speech that contained veiled threats to the opposition; in response, 221 deputies (an absolute majority) condemned the government, and Charles subsequently prorogued and then dissolved parliament. 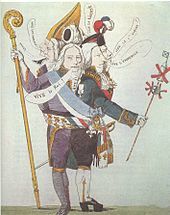 Charles retained a belief that he was popular amongst the unenfranchised mass of the people, and he and Polignac chose to pursue an ambitious foreign policy of colonialism and expansionism, with the assistance of Russia. France had intervened in the Merranean a number of times after Villèle's resignation, and expions were now sent to Greece and Madagascar. Polignac also initiated French colonization in Algeria; victory was announced over the Dey of Algiers in early July. Plans were drawn up to invade Belgium, which was shortly to undergo its own revolution. However, foreign policy did not prove sufficient to divert attention from domestic problems. 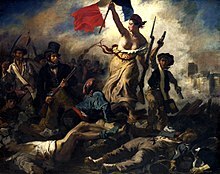 France had recovered from the strain and disorganization, the wars the killings, the horrors, of two decades of disruption. It was at peace throughout the period. It paid a large war indemnity to the winners, but managed to finance that without distress; the occupation soldiers left peacefully. Population increased by 3 millions, and prosperity was strong from 1815 to 1825, with the depression of 1825 caused by bad harvests. The national cr was strong, there was significant increase in public wealth, and the national budget showed a surplus every year. In the private sector, banking grew dramatically, making Paris a world center for finance, along with London. The Rothschild family was world-famous, with the French branch led by James Mayer de Rothschild (1792–1868). The communication system was improved, as roads were upgraded, canals were lengthened, and steamboat traffic became common. Industrialization was delayed in comparison to Britain and Belgium. The railway system had yet to make an appearance. Industry was heavily protected with tariffs, so there was little demand for entrepreneurship or innovation. Charles X repeatedly exacerbated internal tensions, and tried to neutralize his enemies with repressive measures. They totally failed and forced him into exile for the third time. However the government's handling of foreign affairs was a success. France kept a low profile, and Europe forgot of its animosities. Louis and Charles had little interest in foreign affairs, so France played only minor roles. For example, it helped the other powers deal with Greece and Turkey. Charles X mistakenly thought that foreign glory would cover domestic frustration, so he made an all-out effort to conquer Algiers in 1830. He sent a massive force of 38,000 soldiers and 4,500 horses carried by 103 warships and 469 merchant ships. The expion was a dramatic military success. It even paid for itself with captured treasures. The episode launched the second French colonial empire, but it did not provide desperately needed political support for the King at home.